When you think of classic soul labels, a few biggies come to mind...Motown, Stax, Atlantic. As a soul collector, I come across many smaller labels whose releases I enjoy, and certainly the Detroit labels of Ric Tic, Golden World, and Revilot would be up there with Motown for the sheer quality of their releases, but none of those little Detroit labels lasted more than a few years and in fact, the contracts of several of Ed Wingate's artists were bought out by Berry Gordy, leaving Ric Tic and Golden World to fade out towards the end of the 1960's. Revilot's main man, Don Davis, eventually went to Stax himself, mostly likely to take advantage of that label's strong "name brand" so that his artists could better compete with Motown's on the charts. And of course, the quality of Okeh's Chicago-based productions from Carl Davis (with more than a little help from Curtis Mayfield) and later its Los Angeles-based productions on groups like the Seven Souls cannot be denied. But when you think of New York area labels, there are not too many that spring to mind that had both a large number of releases and a tremendous variety of R&B output. I'll leave Atlantic for someone else to worry about for now and concentrate on a label that I believe has been over-shadowed by these others. Wand records was the main subsidiary label of Florence Greenberg's Scepter Records and was set up at the beginning of 1961. In much the same way that Berry Gordy's Motown imprint became synonymous with the Supremes and Four Tops and his Gordy label inextricably linked to the Temptations, so, too did Scepter with the Shirelles and Wand with the inimitable Chuck Jackson. But like the Motown and Gordy labels, both of Florence Greenberg's labels released a lot of quality music during their heyday and were not the sole province of the Shirelles and Chuck Jackson. Scepter also had Tommy Hunt, BJ Thomas, and Dionne Warwick cranking out hit records. I think that Wand has not only lived in the shadows of Berry Gordy's empire, but also in the shadow of Scepter. I would even guess that if you asked the average person on the street about the Shirelles and Chuck Jackson, that most people would immediately know the Shirelles' big hits, but that they might not know of Chuck Jackson's hits. Chuck Jackson was a member of the Del Viking's in the 1950's but left that group after an encounter with Jackie Wilson who encouraged him to concentrate on a solo career. Chuck released some solo singles on a couple of small labels and eventually found himself at Wand at the time of the label's inaugural releases. 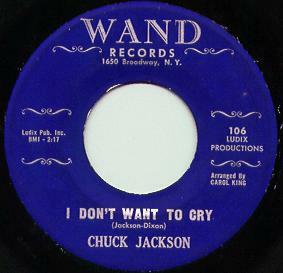 "I don't want to cry" entered the US charts in February '61. His biggest hit was "Any Day Now" in 1962, but his career with Wand and his stature as a star performer remained strong up until the time he left for Motown in 1968. He still a few R&B hits at Motown and later at ABC and All Platinum, but had nowhere near the success of his early Wand days. Chuck wasn't Wand's only hitmaker, however. Russel Byrd's "You better come home" made the charts in 1961, and in 1962, the Isley Brothers' "Twist and Shout" also did all right, selling widely enough (top 20 R&B) to be heard by a little group from Liverpool who later covered it with some success. Maxine Brown had scored 2 major hits at Nomar Records with "All in my mind" and "Funny" before she came to Wand in 1963 where she scored yet again with "Ask me". In 1964, she recorded her most succesful Wand release "Oh no not my baby". This must have done quite well in the UK, since it's been covered by the likes of Rod Stewart and Manfred Mann, who both had sizable UK chart hits with the song. Not wanting to waste any potential success, Wand then paired their two biggest stars (Chuck and Maxine) together to record a series of duets which also fared well on the charts. And then came the BIG one...the single Wand release that most likely paid for all the later flops the label would have.
" At the tail end of 1963, Wand had its biggest ever hit, and a single which sold so hugely and so consistently over a period of some years that its total sales probably equalled those of most other labels' singles output added together. Surprisingly, for a label which focused primarily on black talent, the act in question was the white group the Kingsmen - albeit with a revival of the mid 50's R&B hit "Louie Louie" by Richard Berry. The Kingsmen's "Louie Louie" reached number 1 in the top 100 - Wand's only chart topper - and after its initial chart run of some 4 months, it kept reappearing at the bottom of the chart at frequent intervals over the following two or three years. In the meantime, the Kingsmen had a further seven hits, all in the same R&B thumping style. The biggest were "Money", "Little Latin Lupe Lu", and "Death of an Angel" in 1964 and "The Jolly Green Giant" another top 5 success in 1965." With the success of "Louie Louie", Wand was really in full swing and began bringing in records from outside producers and buying tracks from smaller labels. While much of the label's own product up to that time was produced by New York music industry stalwarts like Luther Dixon (Ludix Productions), the Kingsmen's record had been bought from the tiny Jerden label on the other side of the country. 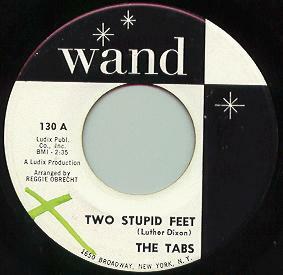 Wand's expansion as a label at this time can be attributed almost entirely to its purchase of master tapes from outside sources financed by the revenues from "Louie Louie". Timmy Shaw was previously on the roster of a small Detroit label before his 1964 hit "Gonna send you back to Georgia" was sent to Wand. Roscoe Robinson's "That's enough" was originally released on a small Chicago label called Gerri, and Nella Dodds' hits "Come see about me" and "Finders Keepers Losers Weepers" were Dynodynamic productions from Philadelphia's own Jimmy Bishop and Kenny Gamble, later to become hugely successful with the O'Jays in the 1970's. Nella's release of "Come See about me" actually came out as a single before the Supremes' version, but alas the momentum of the Detroit trio's previous 2 hits outlasted Nella Dodds and soon her version petered off the charts. After Chuck Jackson left the label in 1968, Wand began a slow slide down the ladder of success, although there were occassional R&B hits. Fred Hughes "Send my baby back", originally released on Wee Records from California, had some chart action in 1968 and the Joe Jeffrey Group's "My Pledge of Love" probably kept the company solvent throughout 1969. The Independents, a group from Chicago and partly the product of the Songwriters Workshop, had some success in 1970 with "Just as long as you need me", "Baby I'm Missing You", and "Leaving Me". Unfortunately, these were the last records to really sell well for Wand, and as the parent label, Scepter, also lost its major artists, the company's fortunes really began to take a dive. There was a brief venture with Fania Records at this time, and while I don't know all the details, I have a feeling it began around the time of Ralfi Pagan's release and was meant to bring some cash into the company to keep it afloat in return for releasing records by LTG Exchange. And while labels like Motown and Atlantic are still going after all these years, the defunct Wand has languished in obscurity. A real pity if you ask me, since the label was apparently quite adept at changing with the times during the 1960's and probably could have sustained some measure of success through the disco era, since even some of its lesser known 70's releases are quite good. Speaking of lesser known releases, now is the time I get to point out some of my favorite obscure Wand releases. In between all the sizable hits that Wand had, there were numerous commercial failures that I think should and could have been hits if they'd received the proper promotion. Wand seemed to give many acts not just one, but two chances at making a hit, as several of the artists on the label appear to have two entries on the discography. The Diplomats were a New York area group that recorded for small labels before and after their stint at Wand and they eventually became the Skullsnaps. Both of their Wand singles are good, but I prefer "Love ain't what it used to be". The Charts came to Wand several years after their biggest doo-wop seller at Bobby Robinson's Everlast label and re-recorded that hit song, "Desiree", in a more up-to-date fashion. Unfortunately for them, it wasn't nearly as successful. Undaunted, Wand released another record by the them, which is one of my favorite releases on the entire label. "Livin' the nightlife" is simply a storming record. Absolutely brilliant. Clarence Reid also released 2 singles on the label. "I refuse to give up" is a nice mid tempo soul record, and its followup "I'm your yes man" is another great example of a pounding, uptempo dance record. 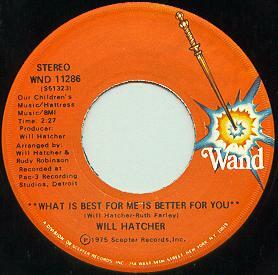 Both were released on Reid's own eponymous label out of Miami before being picked up by Wand. Neither record sold well, however. Shirley and Jessie released 2 R&B-flavored singles which are worth picking up if you like your soul to have a very raw feel to it. Jessie was actually Jessie Hill, a New Orleans-based artist who had quite a productive career, releasing product on numerous labels over the course of many years. The Masqueraders were another group who only had two releases on Wand. Originally from Texas, the group recorded for the miniscule Soultown label and later La Beat Records in Detroit before heading down to Tommy Cogbill's American Studios in Memphis and recording the 4 tracks which would eventually end up on their pair of Wand singles. "Do you love me baby" is an awesome uptempo item, and its flip side "Sweet lovin' woman" is a prime example of down home, gospel flavored soul group harmony. But neither that record, nor "Let's face facts" sold well enough to catapult them to international stardom. They had considerable success after their stint at Wand however, with their AGP releases and then in the 70's under Isaac Hayes' supervision at ABC. They were releasing records into the 1980's - one of the truly under-rated journeymen soul groups. Unfortunately, not all of these wonderful records are easy to find, and often when there are two different Wand releases for a particular act, one always seems much more difficult to locate than the other. Has anyone ever seen Marvin Preyer's pair of Wand releases? His brilliant deep side "What can I call my own", released locally on the Younger label, still needs to find its way onto my record shelf. Of course, not everyone was lucky enough to have two shots at the big time. Billy Thompson's lone release "Black eyed girl" was picked up from the Columbus label, which was apparently based in Boston, although the writing credits go to a couple of New Yorkers. This powerhouse recording didn't seem to sell too many copies anywhere that I know of, despite its full sound and despite the nice version of "Kiss tomorrow goodbye" on the flip, a deep soul item perhaps better known by Danny White. Likewise, Darryl Stewart only got one chance at a Wand release with his ballad "Cross my heart", although the uptempo side, "Name it and claim it", is probably the better song despite the obvious Motown rip off of a riff at the beginning. The Groove's mid tempo mover "Love (it's getting better)" is another one-off entry on the discography, but perhaps their producers had struck a better deal with 20th Century, since this identical recording came out on that label as well. They must have really tried hustling their sounds, since Sal Trimachi and Ritchie Cordell were also responsible for Christine Cooper's Parkway singles. The Gentlemen Four have the distinction of being an early Dionne Warwick prodcution - possibly her first ever. Or maybe she just discovered the group and Wand put her name down on the label in order to encourage DJ's to spin it? It doesn't really matter. It's a great record. The top side, "You can't keep a good man down" is a fantastic uptempo dancer and the flip "It won't hurt" is an emotive ballad just dripping with soul. 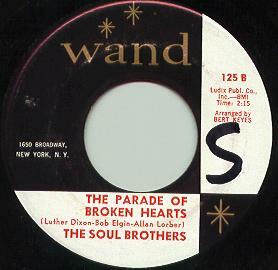 They later recorded for Dionne's Sonday label with a version of one of the Masqueraders' Wand sides, "I don't want nobody to lead me on", before fading into obscurity. One of the more interesting deals that Wand seems to have made was with the Garrison label. Several Garrison releases seem to have a corresponding entry on the Wand discography, but I've never seen any of the actual Wand releases for any of these titles. Earl Harrison's "Humphrey Stomp" is probably the most common Garrison release, but where are all the Wand copies that were supposed to have been pressed? Could it be that after "Humphrey Stomp" started selling well on the initial label, the label owners decided not to follow through on the Wand deal, thinking they would make more money if they did it all themselves? Are Wand copies of Garrison's brilliant Detroit productions of the Honey Bees and the Just Brothers languishing in a warehouse somewhere? Another Wand release brought in from another local label also seems nearly impossible to locate, but it is known to exist, unlike the Garrison stuff. The Ivories "Please stay" came out on a tiny Chicago label called Despenza and is hard enough to find on that label, let alone on Wand. Seems strange that Wand would only try for that one release from that local label, however, since there were other local Chicago groups who recorded for Dispo and Despenza who might have benefited from a Wand distribution deal. From around the same time as the ill-fated Garrison deal, Wand seems to have jumped on the Motown bandwagon and released several Detroit-produced records. They signed a deal with Herman Griffin who wrote or produced several tracks, including Chuck Jackson's only Detroit-related Wand single "Good things come to those who wait" - in my opinion one of Chuck's best releases on the label. Diane Lewis' pair of singles also came from this Herman Griffin connection. Staying with the Detroit theme here, albeit via a Texas label originally, Stemmons Express' lone Wand release "Woman Love Thief" shares a backing track with "Such Misery", the Precisions' first record on the Drew label from Detroit. When the 70's rolled around, Wand opted for a change in the label design from the wonderful black and white block design I've grown to love to a hideous, mottled label that I don't really enjoy looking at. 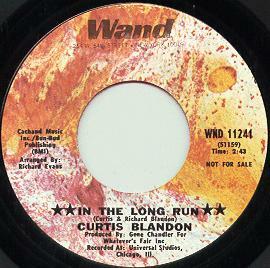 Thankfully, the sound coming out of the grooves matters more than what the label looks like, so I don't have to watch Curtis Blandon's "In the long run" spinning around. I can just soak up the tune. And what a tune it is! A nice slice of Chicago soul produced by the Duke of Earl himself, Gene Chandler. So that's just about all the info I have about Wand, apart from a few more records that I haven't talked about. There are also several releases that I've never had the opportunity to hear, but am very curious about. Lee Charles' Wand output, for example. Two releases in the early 70's.... Hmmm. Everything else I have by him on local Chicago labels is quite good, so I'd love to hear what the 2 Wand singles are like. If anyone has any information about the label or corrections/additions to the discography, please e-mail me the details.